Valve has added a collection of dance taunts for your Team Fortress 2 avatars to use, but the more exciting news is the release of a new animated short. The new taunts include being able to dance the conga, square dance, headbutt one another, do flips, and play rock, paper, scissors. Valve has also launched new achievements in reward of taking advantage of the new taunts. The update also unveils a new short titled, Expiration Date. 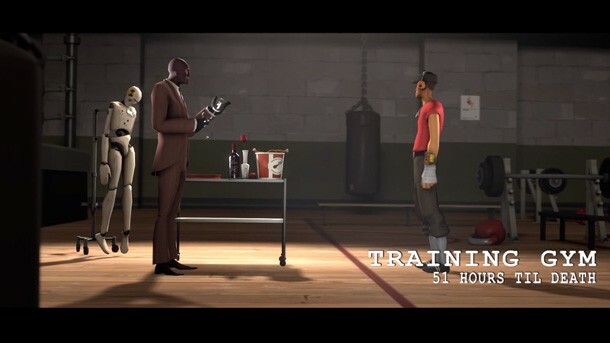 It's longer than any of the previously released Team Fortress 2 shorts, clocking in at nearly 15 minutes. For more on the update, head here. I'm not a dedicated Team Fortress 2 player (though I did sink a lot of hours into the game shortly after release), but I absolutely love the animated shorts Valve release periodically. I could watch a full length feature dedicated to these characters. At this point, with all the introduction videos and this 15 minute short, we've almost got enough content for a 90 minute feature.